I’ve been altering the Sencha blouse pattern from Colette Patterns, and my first attempt was off. I tried to eliminate the riding-up of the front. I eyeballed it at one inch and altered the pattern accordingly. I pinned the pattern together and it was still riding up. This time I measured using something besides my eyeball, and it actually was riding up one inch. Which means it was originally riding up two inches. So, where I added one inch in length at the bust point, I added another inch. The excess at the side was taken out with a dart. Does this hemline look even to you? Yes? Me, too! I’m happy to have this issue resolved. Because of the sleeve construction, the side dart is not level. It points up. I hope this isn’t an issue, because I’m going straight to cutting the silk next. From everything I’ve read, this will be easier if I layer the silk fabric on top of tissue paper and cut both out at once. Time to pull the Christmas wrapping supplies out from under the bed. looks good to me. I have not had the patience to deal with this yet, I’ve had the pattern for quite a while. I will deal with it for Spring hopefully. Sometimes I lightly spray an adhesive that I use for quilt layering on the tissue paper before i lay down the silk, however if the silk is lightweight this won’t work because it will bubble and be difficult to place. Are you going to use your clover clips? Another option is freezer paper. Corinne, I cut the front piece without tissue paper. It seemed like a lot of work, and I was eager to get cutting! I used TONS of silk pins in the seam allowances and got some slightly wavy cuts. Not too bad, I don’t think. But to contrast, I’m going to use tissue paper to cut the back piece and the facings. I’m going to use the remnants to play with seam finishes, as I am still undecided on how to handle them, since a french seam won’t work. 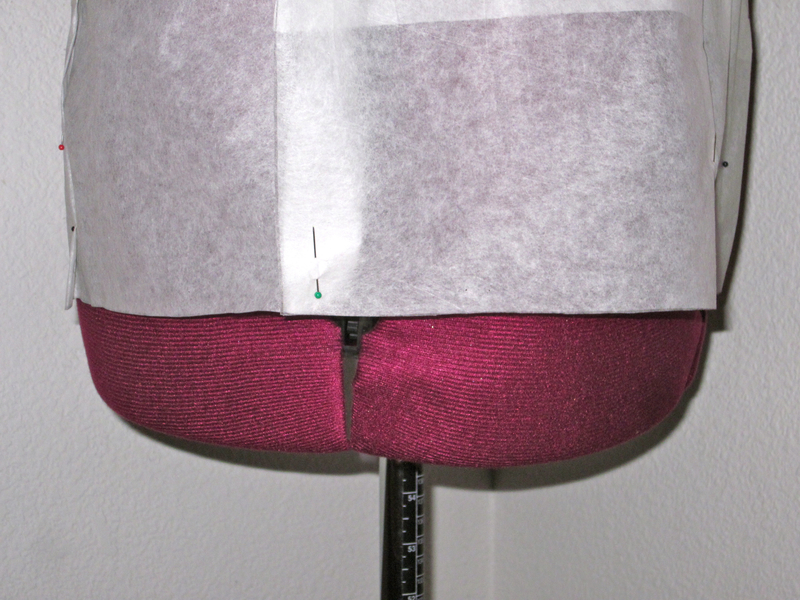 Meanwhile, I draped the front piece on my dress form. It looks great, so I’m inspired not to mess up my first silk project! Thank you so much for visiting. It always helps my motivation!